Following the Beatitudes in Jesus’ Sermon on the Mount, Jesus says to those who are willing to be persecuted “for my sake” that you “are the salt of the earth” and “the light of the world” (Matthew 5:13-14). What does it mean, and how does it happen, that people look like light and taste like salt? There is no substitute for this. Salt cannot savor unless it comes into contact with an object, and light must shine into darkness in order to illuminate it. It may be that today God will bring people into your path that are in need of gospel light and salt. They may be people you know (like Cornelius inviting his family and friends to hear Peter preach) or they may be strangers (like Paul addressing the philosophers at Mars Hill). But if God is concerned that Jesus Christ be glorified in the earth, and if we are open to the Lord’s leading… should it be surprising for Him to lead us to talk with someone about Jesus Christ on a fairly frequent basis? The common usage of the phrase “salt of the earth” is almost always in direct opposition to the way Jesus meant it. We often, in fact, might say that our neighbor — while not a Christian — is “the salt of the earth” because he or she is a good person and an upstanding citizen. But Jesus in context describes, in the third person, those who are poor in spirit, pure in heart, etc. and then specifically is addressing “you” who are persecuted “for my sake.” And it is the same “you” who are standing up “for my sake” that Jesus then says are the light of the world and the salt of the earth. 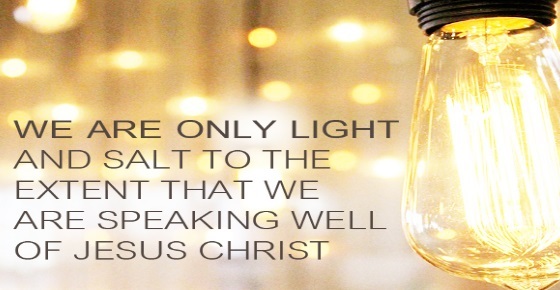 We are only light and salt to the extent that we are speaking and laboring for the glory of Jesus Christ. We have not shared the gospel if we have not explained Jesus (who he is, what he did, and how that relates to us as sinners). Our first motivation, like God’s, must be the glory of God; this makes every effort a success, as long as his glory was proclaimed, no matter what results or response we see. We are light as long as we shine, whether people run to it or away from it. We are salt as long as we have the savor of Christ about us, whether people like the taste of Him or not. Don’t forget this goal, even in the throws of personal disagreement or even public opposition. Our desire is not to win arguments but to win people. Yet, ultimately, if we speak well of Christ — and represent Christ well with our lives — we have succeeded no matter how others respond. Never be deceived into thinking that your savoriness, as a Christian, comes from your likeable personality or forceful reasoning or effective salesmanship. The one thing that separates you from unbelievers, and gives your life meaning and hope and wisdom, is Jesus Christ. What makes your witness shine, your testimony tasty, is simply this: the beauty of Jesus Christ displayed and declared in your life. But that also means you can be an effective witness for Christ regardless of your personality or particular set of gifts. Don’t try to be what you aren’t, but do what you can — to the best of your ability and in the context in which God has placed you — to proclaim Christ.